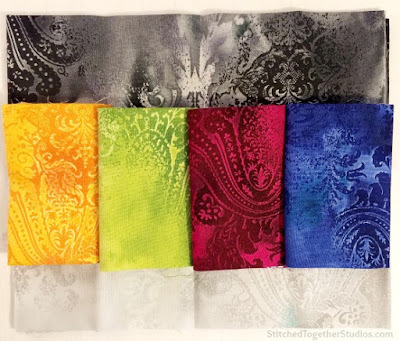 Hello, fabric lovers! 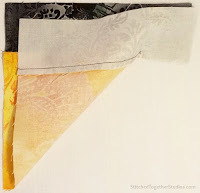 We're continuing to share our Dreamscape Block Blog Hop today. It's the third day of seven different block tutorials for you featuring our luscious Dreamscape prints; we'll be featuring a tutorial each day through next Wednesday (we're taking the weekend off!). For this blog hop, we selected a six-color palette to play with: Navy, Cloud, Lime, Grape, Daffodil and Lead. You'll love the variety of blocks our designers have created! And make sure you enter each day's giveaway for a chance to win fat quarters of these six Dreamscape prints! Enjoy! Hi everyone! 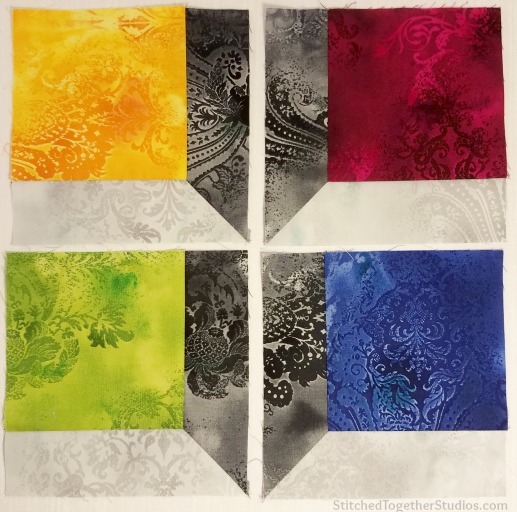 Stephanie from Stitched Together Studios here ... 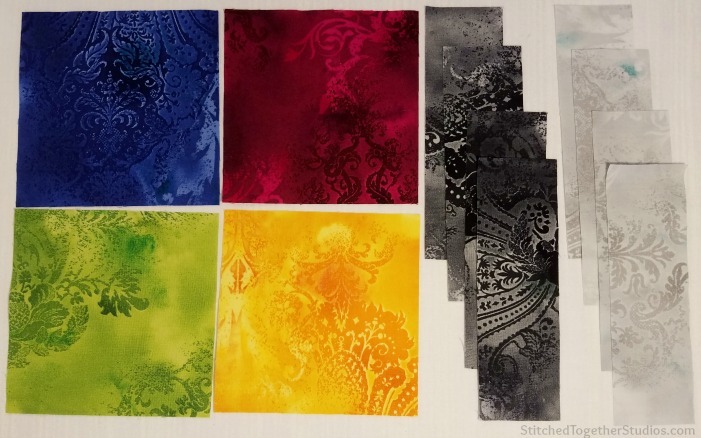 I am very excited to have had the chance to work with these fantastic Dreamscape fabrics! 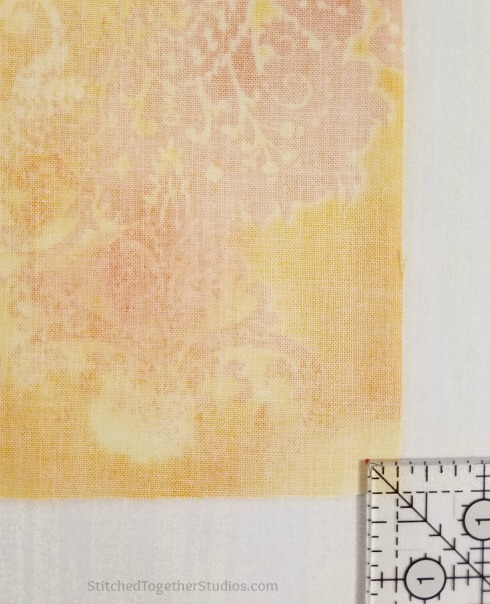 When I laid out the fat quarters the colors reminded me of birthstones of some of my family! A Garnet (grape) for my oldest son, Emerald (lime) for my husband, Sapphire (navy) for my daughter and Citrine (daffodil) for my Mom, whose birthday was yesterday! 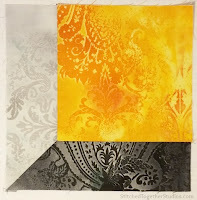 These gemstone colors inspired my "Jewel Box Block" ~ a riff on a classic attic windows block. 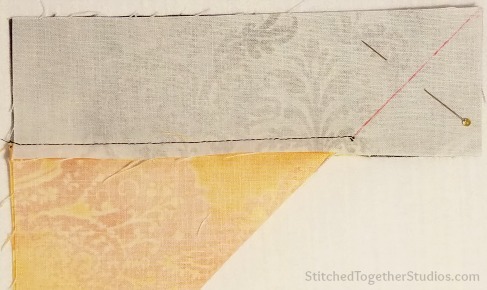 I have a quick and easy method for creating the inset seam ... give it a shot! 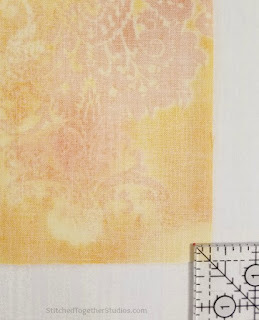 Step 1: On the back of each 5" square make a small dot 1/4" from the corner. 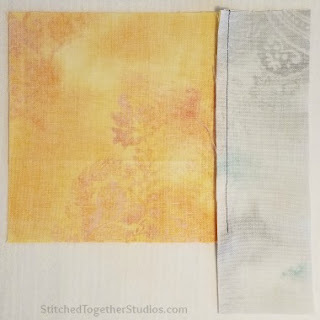 Step 2: Lay 5" daffodil square on top of 2" X 6-1/2" cloud rectangle, then sew together with a 1/4" seam, stopping at dot. (Note - I don't normally piece with black thread ... I just did it here to make it easy for you to see!) 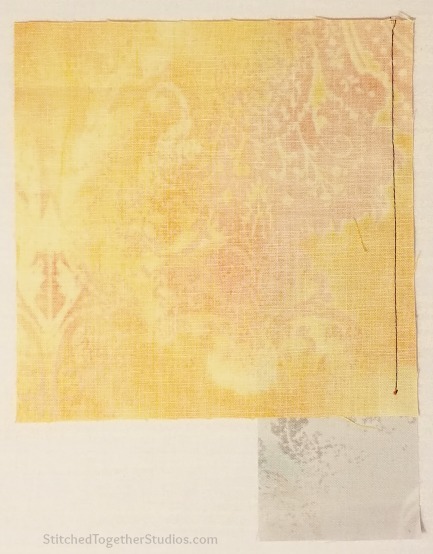 Then press with seam allowance towards 5" square. 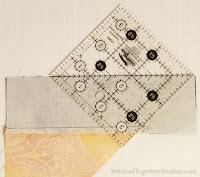 Step 3: Add the 2" X 6-1/2" lead rectangle to adjacent side, again stopping at the dot and press. Step 4: Fold the block in half diagonally, lining up seams and edges of the lead and cloud rectangles. Line up a small ruler (I used a 2-1/2" square) as shown and draw a line from intersection of seams to the corner of the top rectangle. Use a pin if desired to hold the 2 rectangles in place. Step 5: Sew on drawn line, then press open and trim to 1/4" ... there you have a perfect 6-1/2" attic window block! Repeat steps 1 - 5 to create your Emerald, Garnet and Sapphire blocks as shown below (Note: placement of lead color strips on the grape and navy squares is different than the lime and daffodil). Step 6: Arrange the 4 jewel blocks as shown and sew together. 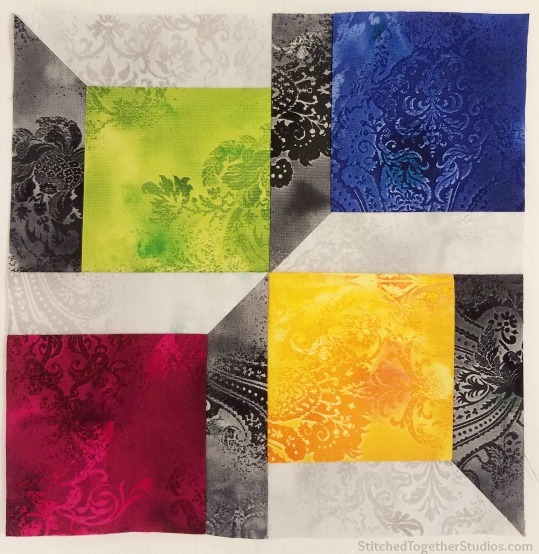 Here is a mock-up of what 12 blocks would look like - a beautiful bright 36" x 48" lap quilt. Thanks, Stephanie! Leave a comment below letting us know that you follow us on one of our social media platforms (here on the blog--right hand sidebar, Facebook, Instagram, Pinterest), as well as your favorite Dreamscape color. I follow you by email,instagram and Facebook!! Wow....that is a great block. I am going to give those seams another try. You make it look so easy. I love your blocks! So pretty! I follow by email. I like the Lead color. It would be a great background fabric. I follow by email and Facebook. I love Dreamscape Violet. I follow thru bloglovin, Email & Pinterest too! :) Love the Lime..& the Turquoise!!! I follow on BL and E-mail. The violet and blue are wonderful. I follow via email notice. I like the blue and green. Wow! This block is gorgeous! Thank you for the giveaway. I follow you on Bloglovin and GFC. My favorite color is dreamscape Jade. I follow on Facebook, as well as through Bloglovin' and email notification. My favorite color and 2nd favorite would be Dreamscape Grape SKU 1046-63 is my top favorite, but Dreamscape Lead SKU 1046-11 is an awesome blend of colors. I follow by email and bloglovin'. I love the Sapphire Stephanie used in her quilt tutorial today! 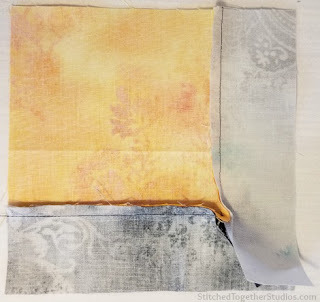 Thank you Stephanie for doing this great tutorial on set in seams. I have avoided every pattern that has them. 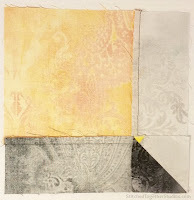 Yet, after your tutorial I feel very confident that I can make your quilt! Thank you for the opportunity to win this lovely bundle of fabric and for introducing me to these great designers! Thanks for the great tutorial, especially the close up photos of the mitered corners. My fav colour in Dreamscapes is bluebell. I follow by email and FB and am very glad that I do. I follow via e-mail and FB. :) Loving the blue. I follow you by email and love the Dreamscape Lime color. Fabulous,love the 3 D effect.I follow by email .Love the greens. Forgot to say, I am following on bloglovin. Great block! I think my favorite color is Daffodil. I follow via e-mail. Love the blocks together. I follow with email. I follow on the Blog by email and love the Scarlet color. Love that! I follow on Feedly. Love those amazing colors too. I follow via email. I like Citrine. I follow you on facebook - and I love the blue! This is a lovely block and all of the colors in the collectio nremind me of gem stones. Red is my favorite followed closely by all the rest. I follow you via email and Bloglovin. I follow the blg by email. Favorite color is Lime but I really love them all. What a great block Stephanie created. I follow via Bloglovin. I love the Lime color! I follow by email. The Grape color is gorgeous! Follow you on facebook: Nicole Sender & instagram: minibea123. The grape color is my favorite! I follow the blog by email and I follow on Facebook. I follow on facebook and email. I love the Garnet color. I follow on Facebook, Instagram, and by email. My favorite color is red! 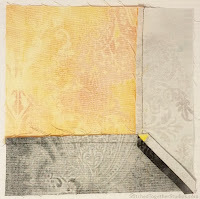 I follow by a quilting guild. Thanks for offering fat quarters. i love it all, must i choose one? ok lets go for garnet. I follow you through e-mail. I love the purple color. Thank you for the tutorial. What a fun block, love the colors. I follow you through e-mail. I follow you by e-mail. Favorite colors are the reds or dark pinks! My favorite fabric in this collection is Periwinkle! I am a Bloglovin' follower. Thanks for sharing this tutorial! The block is gorgeous! I follow you via Instagram, and my favorite color in the collection is Periwinkle. Great block. I follow via email. Thanks. I follow through email. Love the blue and green. Thanks for the giveaway. I already followed you on Facebook. Now I also follow you on Instagram & Pinterest! I like all the Dreamscape bright colors--who can choose just one of those yummy jewels. The lead & cloud are what makes those brights pop! I follow the blog here by GFC. My favorite color of Dreamscape? All of them, but I love the Scarlet. I follow on Bloglovin, thanks for all the beautiful ideas. I follow the blog on my blogger dashboard/GFC. Earlier in the week I picked Emerald as my favorite dreamscape color, but today that Navy is looking awfully good! Maybe I had some grape juice, I would be more social. I follow via email--stunning fabric!! I follow you via IG, FB, and email!!! This fabric is so rich and vibrant, its gorgeous!! My favourite colour is Magenta... but they are all gorgeous!! I follow by email. Love this fabric! I love all of the colors but Cloud is the perfect neutral! I follow on Instagram. I just adore all these colors, but the grape and lime catch my eye the most. Wonderful block! I follow you on facebook. Very nice block. My favorite color of dreamscape is Turquoise. But they are all so beautiful. 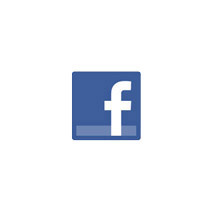 I now follow on facebook. I'm totally in love with this block and the bright beautiful colors. thanks for the fun. Each one of the colors could easily be my favorite, but if I had to pick just one (LOL) it would be the turquoise. I follow on FB and bloglovin, Red is my favorite.